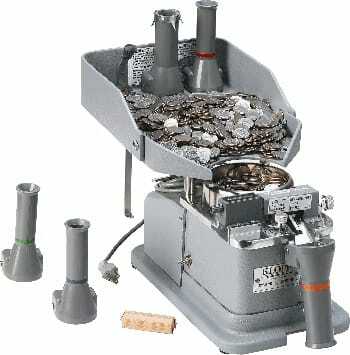 The Klopp CM is an electric coin counter, wrapper and bagger. This unit will count coins one denomination at time. You can’t add mix coin in this unit. It has batch counter you can set manually to count and stop in preset number. The Bag holders also can be use with this unit. Counts, wraps or bags dollars, quarters, nickels, dimes, pennies and tokens one denomination at a time. To wrap the coins, insert the coin wrapping paper in the coin tube and run the machine, Preset batch can stop the unit when it reached to preset numbers. Wrapping tubes and papers are sold separately.